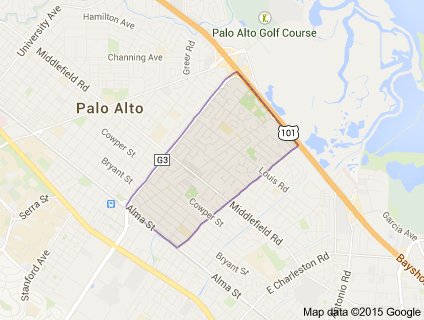 A quiet, neatly organized, comfortable neighborhood community, Midtown in Palo Alto is located between Oregon Expressway and Loma Verde Avenue, Alma Street and West Bayshore Road. Once part of a state-wide development boom following World War II, Midtown could mostly be seen as a stereotypical suburban neighborhood until the 1990’s. Property owners then started remodeling their homes or building brand new ones, and the home values in Midtown grew with them. Midtown now offers a good blend of mid-sized bungalows and larger new homes. A lot of residents have been there for decades and love the close-knit, family-oriented community feel. They also appreciate being close to so many amenities and facilities. Middlefield Road’s Safeway, Sancho’s Taqueria or the Charleston shopping center’s Peet’s or Piazza’s Fine Foods are just a short stroll away, and a good part of the neighborhood is also within walking distance to Caltrain. Midtown’s Bryant Street - also called “Bike Boulevard”- is closed to car traffic at several intersections, making it the ideal path for bikers from Menlo Park all the way to Mountain View. - Grace Lutheran Preschool, 3149 Waverley St.
- Mini Infant Center of Palo Alto, 3149 Waverley St.
- Ohlone Kids' Club (PACCC), 950 Amarillo Ave.
- Palo Alto Friends Nursery School, 957 Colorado Ave.
- Greer Park, 1098 Amarillo Ave.
- Hoover Park, 2901 Cowper St.